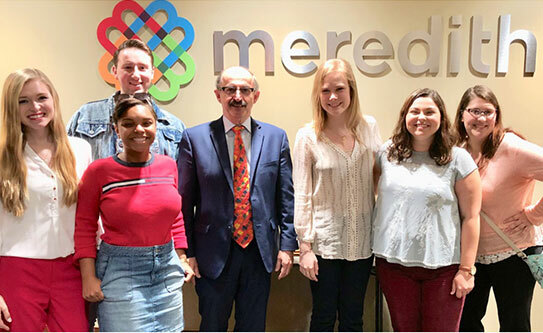 Samir Husni, Ph.D., also known as Mr. Magazine, recently took six magazine students with him to visit the Meredith Corp. in Birmingham, publisher of Southern Living, Coastal Living, Cooking Light and Food & Wine. They spent a day with magazine editors and toured the famous test kitchens. 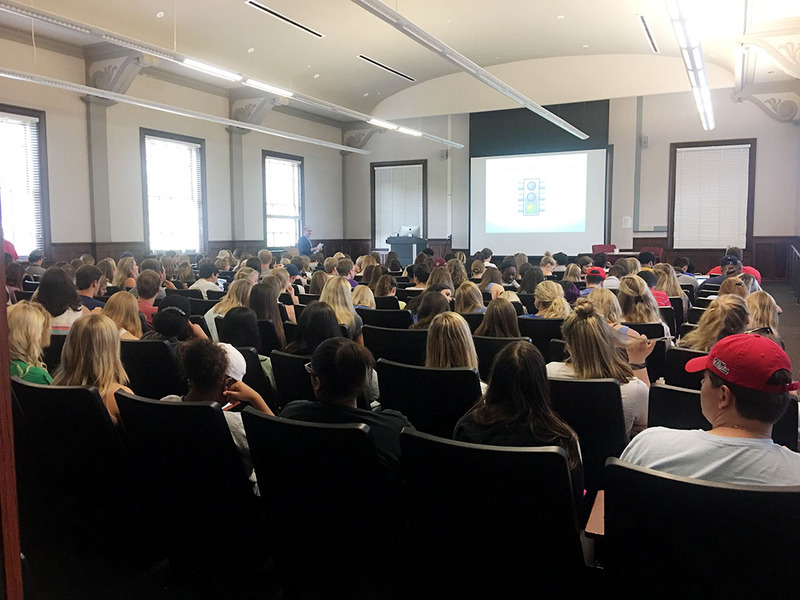 Sid Evans, editor-in-chief of Southern Living and Coastal Living, and Hunter Lewis, editor-in-chief of Cooking Light and Food & Wine magazines reviewed and commented on the magazine students’ magazine ideas. 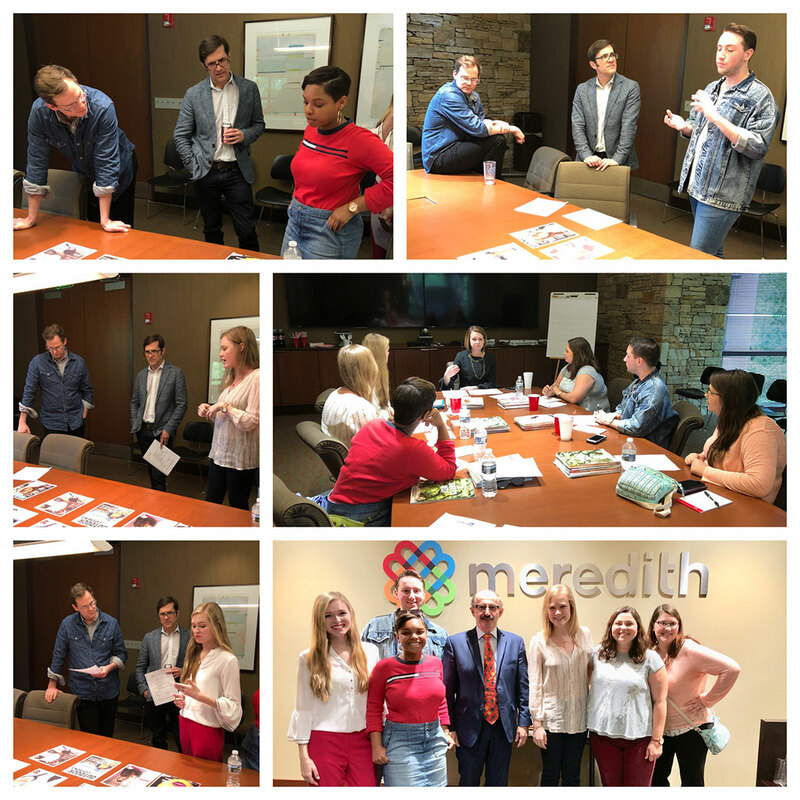 The one-day trip ended with an hour and a half meeting with the director of human resources at Meredith in Birmingham, Carole Cain. Hannah Willis was one of the students who attended. Willis said she learned a lot. 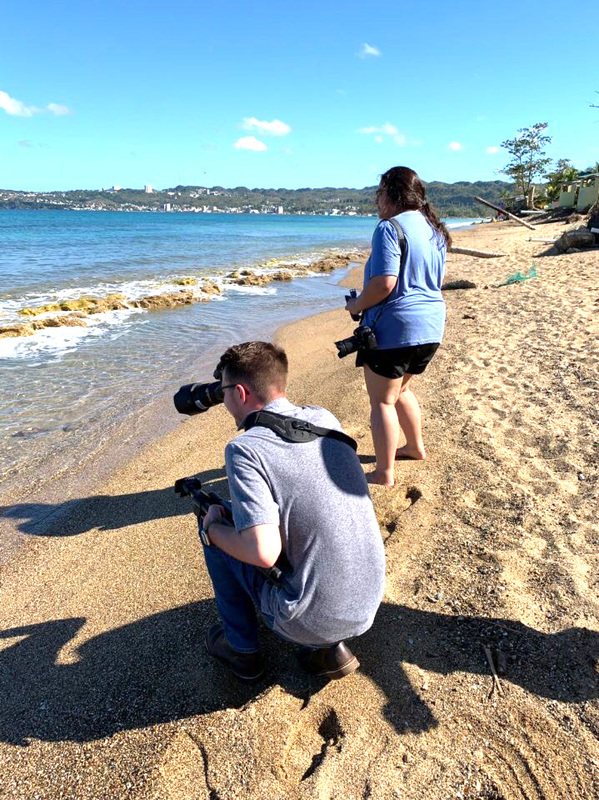 “Most importantly, I learned that this is a constant job that requires an individual to stay on top of all trends while creating excellent content and navigating the differences between their print and digital platforms,” she said. 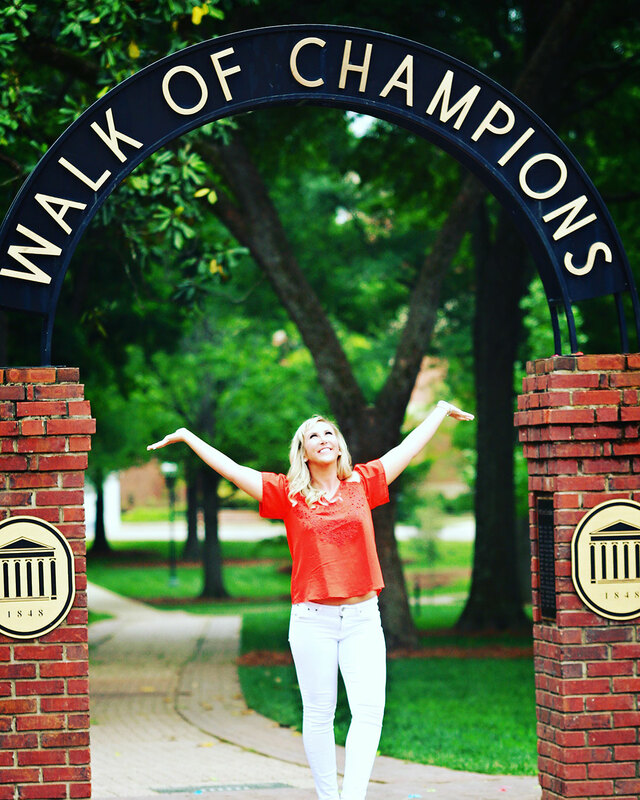 Lana Ferguson, editor-in-chief of The Daily Mississippian, the University of Mississippi’s campus newspaper, said students met and interacted with different people in charge of different parts of the magazines and brands. Ferguson, who said she remembers flipping through the pages of Southern Living magazine before she could read, said she was surprised by some of the things she learned during the tour. 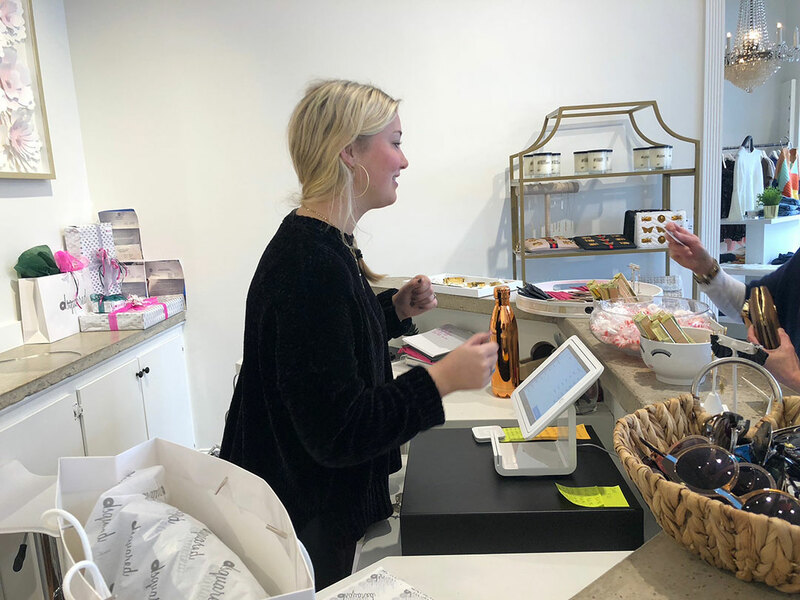 “As someone who has interned with a magazine and held editor roles in a newspaper, I thought I had an idea of how these legacy brands were run, but this experience was eye opening,” she said. 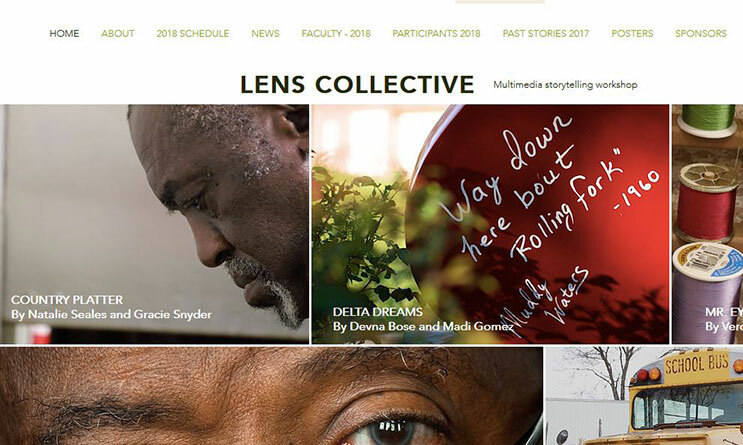 “I now know some of the intricate details and effort that goes into every page of a magazine, the scheduling of production months in advance, and the developing of digital pieces that supplement the already-established print products. Student Brittany Abbott said she was impressed by many things, including the building. Abbott said she learned it takes a team to make a successful magazine like Parents or Southern Living. 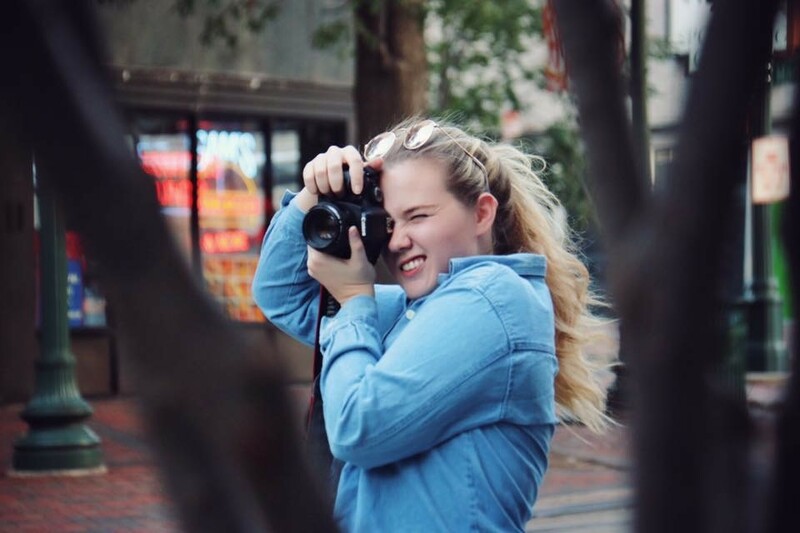 Videographer, journalist and social media guru are all words used to describe Kayla Beatty. 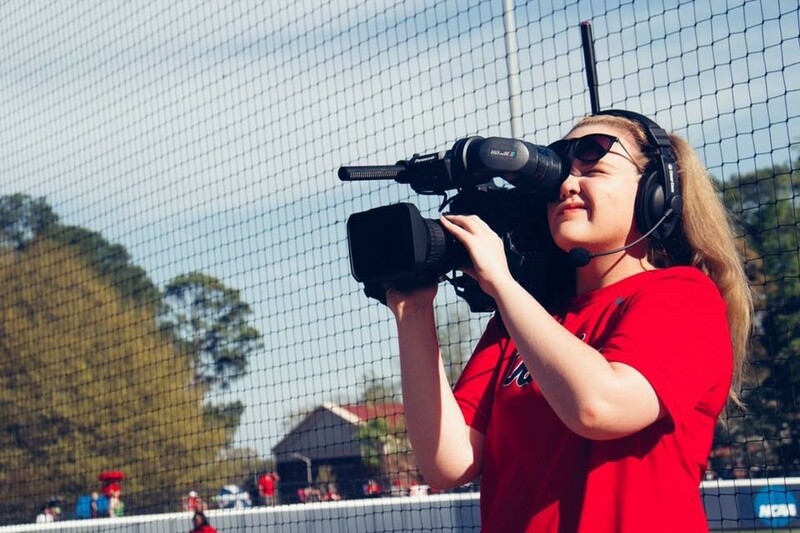 Beatty is a senior at the University of Mississippi and in her second year working for Ole Miss Athletics in production. 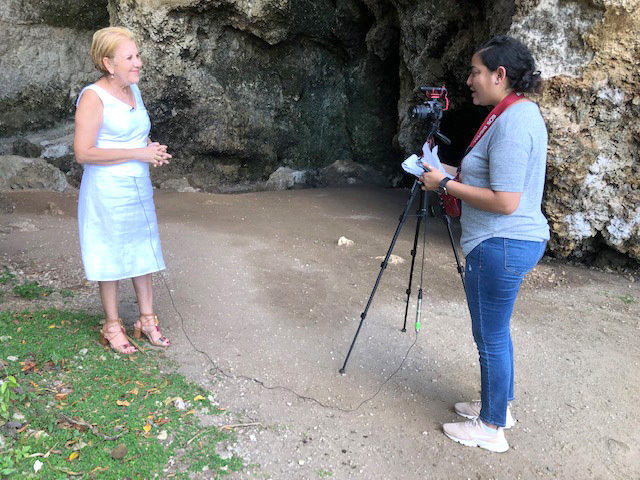 As a journalism student, she has gained essential skills for working professionally in the field. 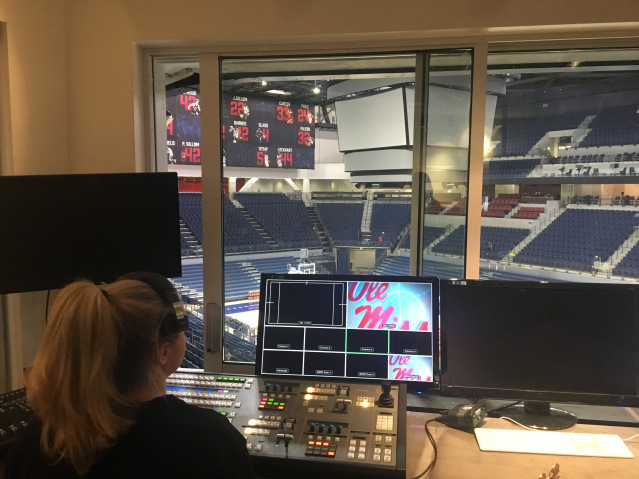 As a main videographer for Ole Miss Athletics, Beatty has worked every sports event at Ole Miss. Her favorite sport is basketball, but not always. “I grew up watching soccer,” she said. “I knew nothing about football, basketball or baseball. She quickly learned the sports and now sometimes thinks she could coach them. Beatty works on a team of roughly nine to 12 people. Half of them are students. This a paid job, but her first year counted as internship credit. 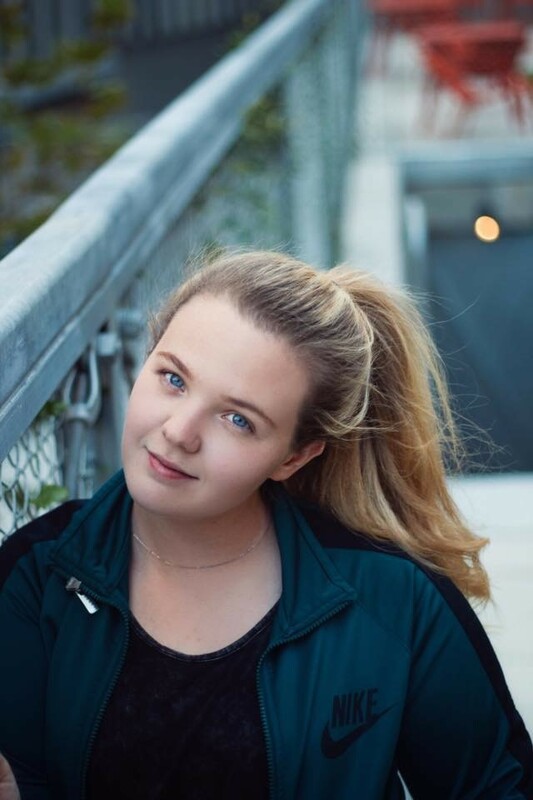 “While I may not go into the sports production field, the skills and opportunities I have been given are out of this world,” said Beatty. Before every basketball game, the team of videographers meet two hours before to begin testing equipment. There are multiple cameras around the Pavilion to get high and low shots. They check lighting, sound and angles to get the perfect shot at game time. An hour before the game begins, they get into position. They start getting clips of the crowd, and the teams warm up. The team films everything that spectators see in the arena and what is posted throughout the game on social media. Everything that the cameras in the arena pick up is sent immediately to the control room. There, staff members operate music, lights and everything you see on the jumbotron. They also quickly make graphics for social media and talk with SEC Sports. Beatty’s favorite video to capture is when she follows the ball closely on camera and gets the angle as it lands in the net. She uses a “slash camera” to achieve this. This was one of the hardest skills to perfect. She said she is still learning. Videography and photography is all about practicing. When she first started, she shadowed an existing staff member to learn the basics. After shadowing someone with experience, the videographers are on their own. After about a year, they usually end up having a shadow or “buddy” to teach. Beatty said the most important piece of advice is know your equipment. Supervisor Hank Lena is their main support. Lena works the control room and is in charge of the team during the game. Another favorite part of the job for Beatty is creating graphics for Ole Miss sports teams’ social media. Within minutes of the live footage, the staff sends Tweets, Instagram posts and Snapchats. A great part of working for Ole Miss productions is they allow everyone to rotate positions. Everyone may have their preference, but they are given the opportunity to use a high camera, low camera or work in the control room. Staff is exposed to videography, still photography and social media. Work does not feel like work when it is doing something you love. Everyday is different working in production. “I love what I get to do for a living, so hiring people that are also so passionate about journalism is the best part,” said Lena. A lot of hard work goes into what looks easy to the average viewer at a sporting event. From preparation to putting all the footage together at the end, students and staff move quickly. 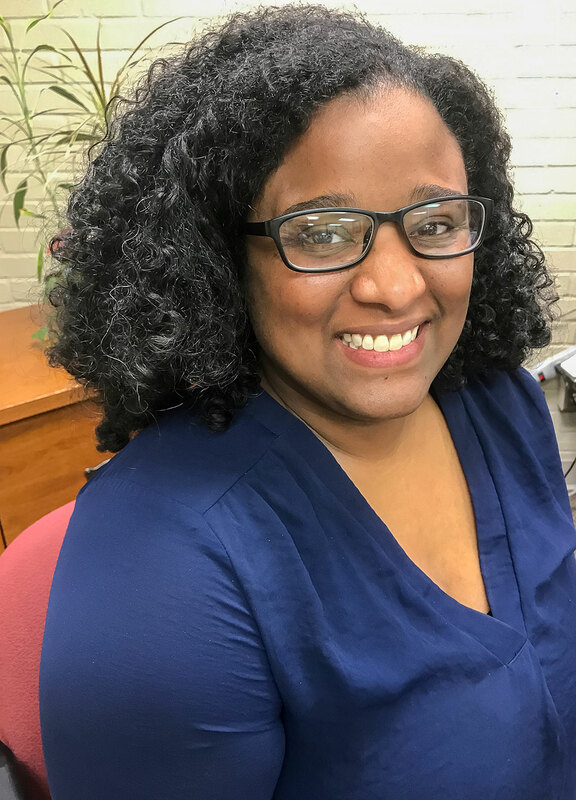 Beatty said she wishes she had known about this job earlier in her college career because of the skills she has learned and the connections and people she has met. She hopes to continue learning as much as she can this upcoming basketball season. The Meek School of Journalism and New Media knows how to tailgate. Here is a gallery of photos from a recent Grove get-together before the Louisiana State University game. Meek School instructor Timothy Ivy took the photos. The Meek School held three events this year during football game days to greet and welcome Meek School alumni. Plans are in the works to do it again next year. We hope to see you there. 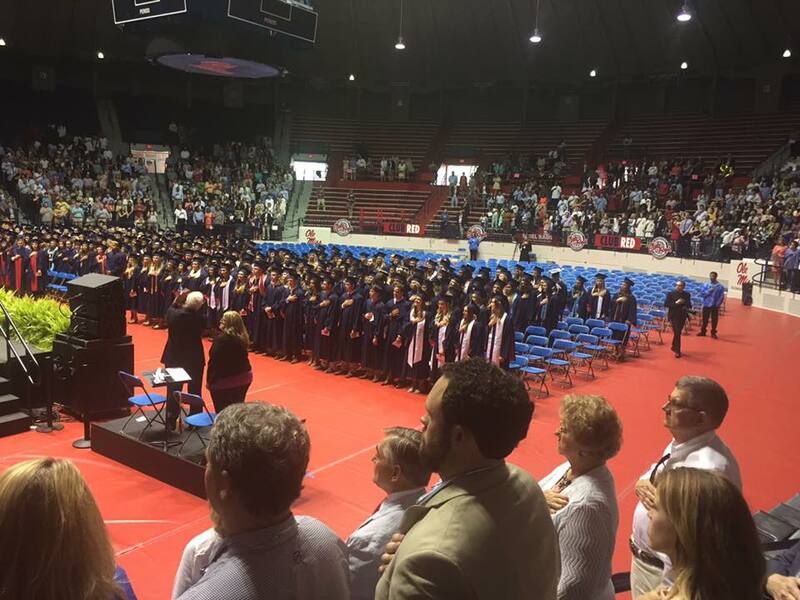 Saturday was a beautiful day to see more than 300 University of Mississippi Meek School of Journalism and New Media students in cap and gown congregate inside the Tad Smith Coliseum to receive diplomas during commencement exercises. Meek School Dean Will Norton Jr., Ph.D., spoke to the audience of proud family members and graduates Saturday afternoon. Davis, who has worked in the world’s highest levels of marketing and advertising, has worked for powerhouse brands such as Crest toothpaste, Pampers, Dawn detergent, Scope mouthwash, Bounce fabric softener, Gillette Trac II razor blades and Tropicana premium orange juice. “Make no mistake,” said Norton. “He is not Don Draper, one of the executives of the ‘Mad Men’ television series who worked and played at one of New York City’s most prestigious ad agencies at the beginning of the 1960s. The Nebraska native was a double major who earned a bachelor of arts degree from the University of Nebraska College of Journalism (with an emphasis in advertising studies) and the Department of Sociology. He later became president of J. Water Thompson’s flagship Chicago office. The agency worked to brand Sears Die Hard and Craftsman products, created the Oscar Mayer Bologna and Hot Dog campaign, and the Kibbles and Bits campaign. 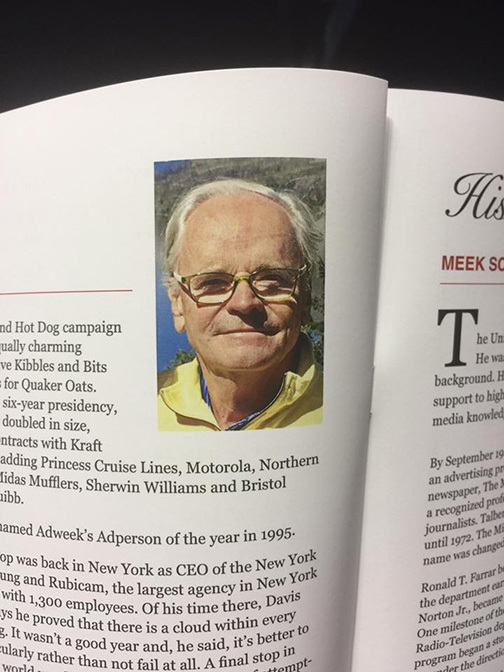 Steve was named Adweek’s Adperson of the year in 1995. Today, he resides in Santa Fe, New Mexico. “Each of us were designed to serve, not to be served,” Davis said Saturday, as he talked about America’s selfie culture. Davis encouraged students to practice gratitude and set goals for their lives. 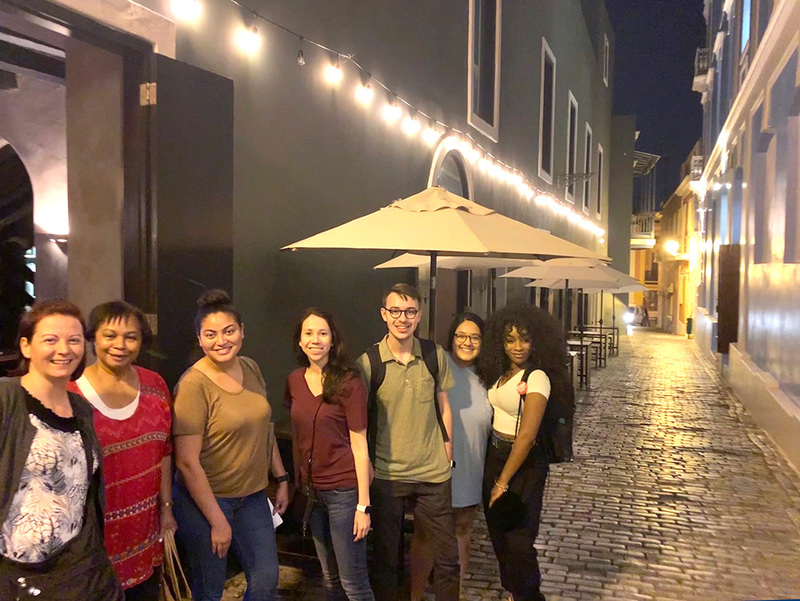 To read more about where some of our Meek School of Journalism and New Media students are headed, check out this story. 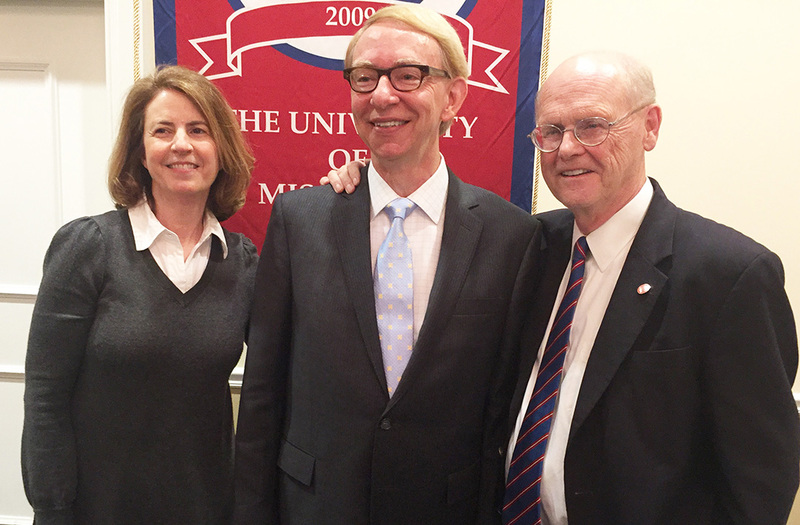 From left, Debora Wenger, Dennis Moore and Will Norton Jr.
Moore was honored Wednesday night as the 58th recipient of the Samuel S. Talbert Silver Em award at the Inn at Ole Miss on the UM campus. The Silver Em is UM’s highest award for journalism. Recipients must be Mississippi natives or have led exemplary careers in the state. Moore began his journalism career as an intern at The Germantown (Tennessee) News. He later directed breaking news coverage for USA Today, the nation’s largest circulation newspaper, on stories such as the shooting of Michael Brown in Ferguson, Missouri; the spread of Ebola from Africa to the United States; and the trial of one of the Boston Marathon bombers. Earlier at USA Today, he was managing editor of the Life section, which put him in contact with Mick Jagger, John Grisham, Steven Spielberg and and many other notable people. Moore said his favorite entertainment interview was with Octavia Spencer, who won an Oscar for her role in “The Help,” a book that became a movie written by fellow UM graduate Katherine Stockett set in Jackson, where Moore began his professional reporting career at The Clarion-Ledger. 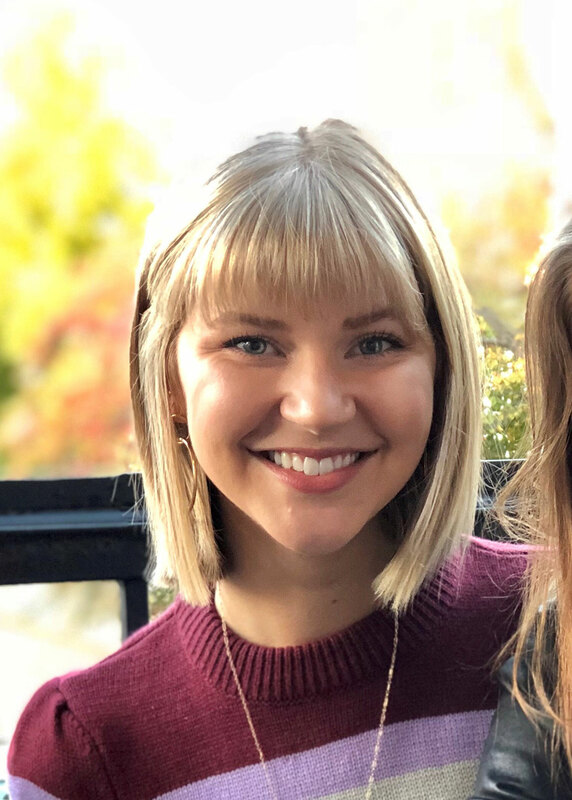 Moore is now co-editor of Mississippi Today, a news website, with Fred Anklam, also a USA Today and Clarion-Ledger veteran, Ole Miss graduate and Silver Em recipient. “When I found out I was going to receive the award, I thought I don’t measure up to the previous recipients,” Moore said Wednesday during his acceptance speech. “I don’t think my accomplishments are as stellar as theirs. However, Moore said he believes the staffs he’s worked with over the years have applied the same enthusiasm, vigor and aggressive newsgathering that people on other beats did while covering the entertainment industry. “We just had more fun,” he said. Moore said he likes to think he’s helped people understand the importance of critical thinking. “I believe if you look insightfully, if you look aggressively at popular culture, you can find out as much about society as if you write a news story,” he said. Moore said he’s concerned about the lack of critical thinking in modern journalism. He said journalists must present facts and provide information to defend them because, in a “fake news” era, the public questions the media. “They don’t have the confidence,” he said. “I believe we can do that by reporting and providing context. By context, I don’t mean let’s interpret for people. Let’s get enough facts so that we can speak confidently, authoritatively and can address issues in a way that can’t be questioned. While Moore is concerned about the state of journalism today, he said he’s also encouraged, because he thinks journalists are on a good path. 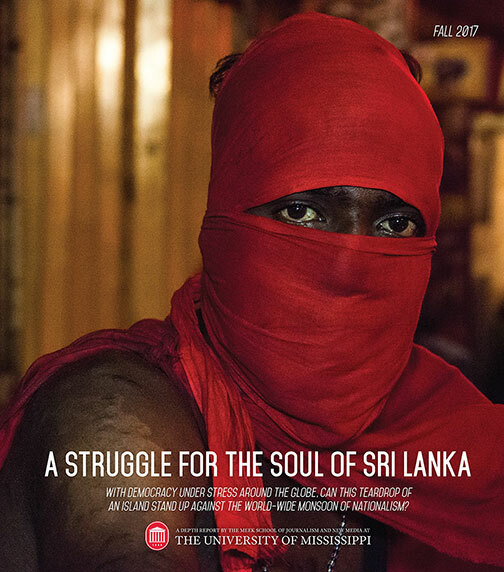 “We have to report with depth, insight, and then we may be able to affect change,” he said. Norton said he went through issues of The Daily Mississippian from 1973 to 1975 to look at some of Moore’s work as a student journalist. He found several stories, including one titled ‘Dorm Hunting, the night I kicked my leg through the wall, I decided it was time to move.’ Moore wrote light and serious pieces for the college newspaper, including stories about UM applying again for a Phi Beta Kappa chapter and voting issues. “Whether it was about shoddy campus housing, lack of freedom for faculty members or voting rights, tonight’s honoree always seemed to focus on important news,” said Norton, who gave attendees an update about the Meek School of Journalism and New Media. “During the 1974-75 academic year, the Department of Journalism had fewer than 100 majors, and an accreditation team made its first site visit to the campus,” he said. “The endowment of the department was less than $50,000. Norton said the endowment today is more than $13 million with a major estate committed to the future. Hoar was one of the event attendees Wednesday night, and he was recognized for his contribution to the school. 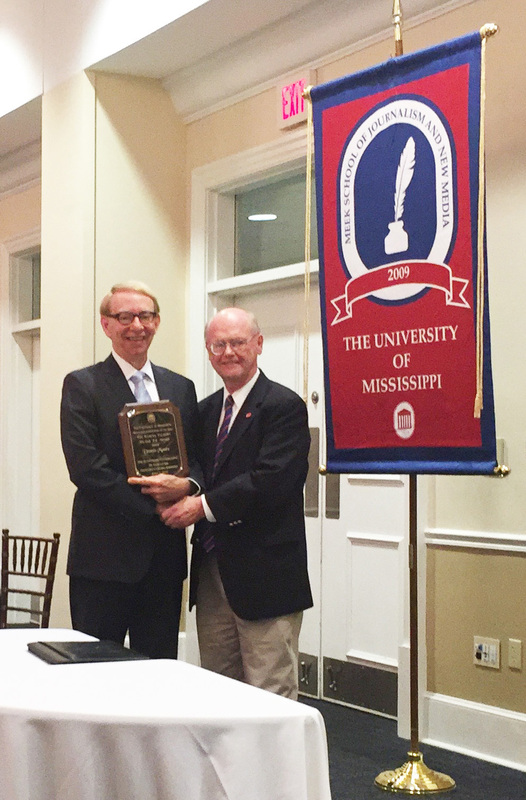 The Silver Em award is named for Talbert, the professor and department chairman, who believed a great department of journalism could be an asset to the state of Mississippi. An “em” was used in printing. In the days of printing with raised metal letters, lines of type were “justified” by skilled insertion of spacing with blanks of three widths – thin, en and em. The Silver Em blends the printing unit of measure with the “M” for Mississippi. Meek journalism students were also honored during the event, which featured the Best of Meek awards ceremony. Students who received Taylor Medals include Rachel Anderson, Katelin Davis, Hannah Hurdle and Ariyl Onstott. The Kappa Tau Alpha Graduate Scholar was Stefanie Linn Goodwiller. The KTA Undergraduate Scholar was Ariyl Onstott. Graduate Excellence winners were Mrudvi Parind Vakshi and Jane Cathryn Walton. The Lambda Sigma winner was Susan Clara Turnage. Excellence in Integrated Marketing Communications winners were Austin McKay Dean and Sharnique G’Shay Smith. Excellence in Journalism winners were Maison Elizabeth Heil and John Cooper Lawton. Who’s Who winners were Rachel Anderson, Ferderica Cobb, Austin Dean, Elizabeth Ervin, Leah Gibson, Madison Heil, Cady Herring, Rachel Holman, Amanda Hunt, Hannah Hurdle, Amanda Jones, John Lawton, Taylor Lewis, Ariyl Onstott, Meredith Parker, Susan Clara Turnage, Sudu Upadhyay and Brittanee Wallace. The Overby Award was given to Susan Clara Turnage. Kappa Tau Alpha inductees include Brandi Embrey, Elizabeth Estes, Madison Heil, Rachael Holman, Hannah Hurdle, Tousley Leake, Taylor Lewis, Jessica Love, Hailey McKee, Olivia Morgan, Ariyl Onstott, Alexandria Paton, Natalie Seales and Zachary Shaw. Dean’s Award winners include Madeleine Dear, Lana Ferguson, Kylie Fichter, Jennifer Froning, Dylan Lewis, Emily Lindstrom, Sarah McCullen, Dixie McPherson, Anna Miller, Rashad Newsom, Hannah Pickett, Kalah Walker, Brittanee Wallace, Kara Weller and Anna Wierman. 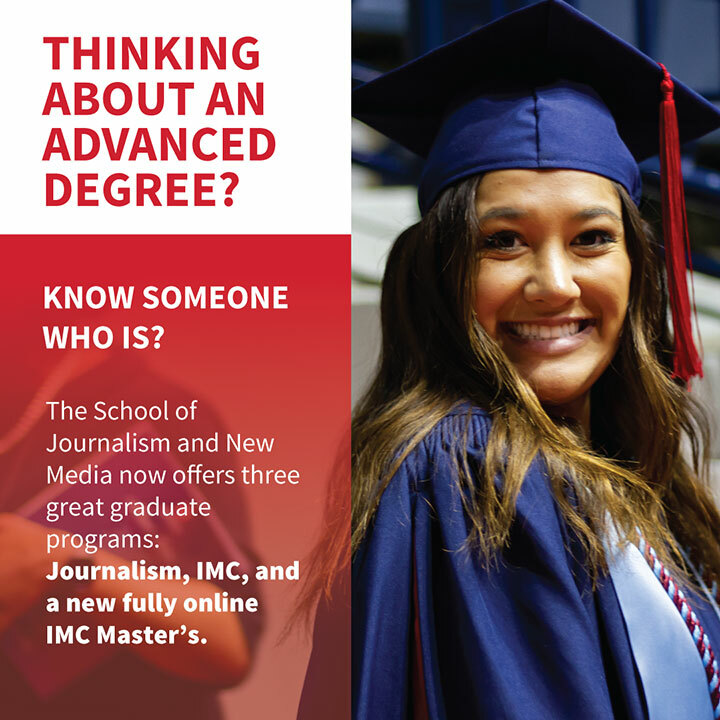 The Meek School of Journalism and New Media was founded in 2009 with a $5.9 million gift from Dr. Ed and Becky Meek, Ole Miss graduates with a long history of support. It is housed in Farley Hall, with a wing for the Overby Center for Southern Journalism and Politics. 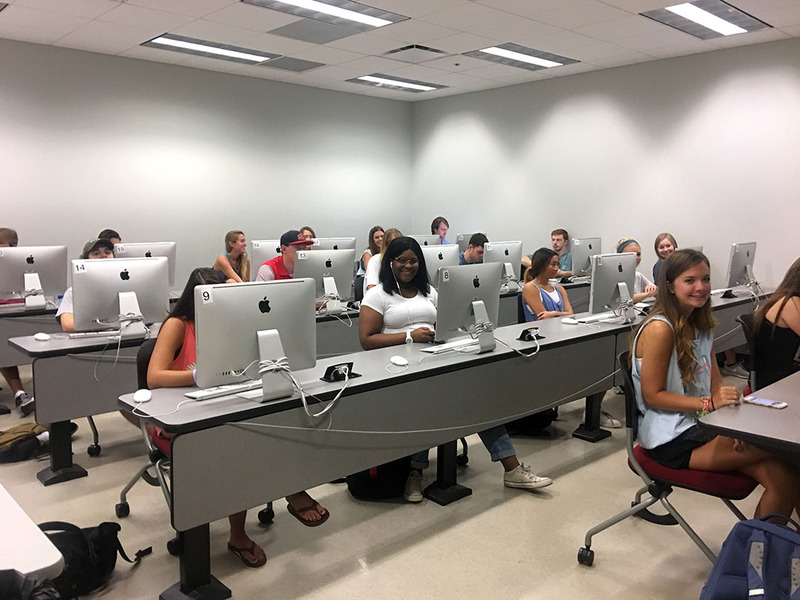 Today, the Meek School has 1,570 students in undergraduate and graduate studies working toward degrees in journalism and IMC. For more information, email meekschool@olemiss.edu.